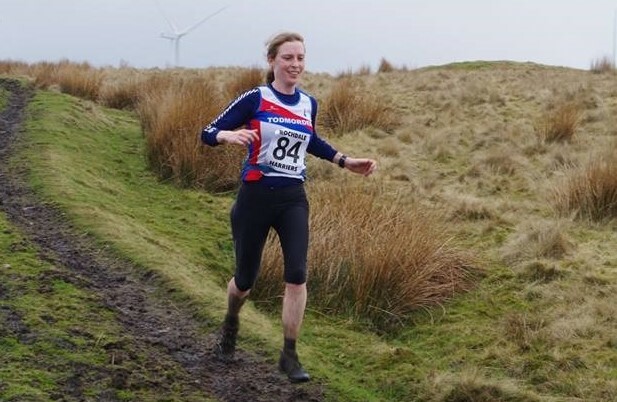 On Saturday 7th April, the Todmorden Harriers fell championships continued with the Wardle Skyline fell race. This local gem features 1250ft of climb over its 7 mile distance. Todmorden turned up in force with 16 in action of the 142 strong field. There were some great performances on display for the club. Andrew Worster came 2nd overall in 48.54 and Pauline May won the ladies race in 1.00.54 and 44th overall. Some other notable performances were Martin Roberts for 1st V60 in 1.02.24, Melanie Blackhurst for 1st V50 in 1.05.33 and Richard Blakeley as 1st V75 in 1.14.36. The race was won by Chris Richards of Salford Harriers in 48.16. 2 Andrew Worster 48.54; 26 Rob Gray 56.50; 39 Richardf Butterwick 59.42; 44 Pauline May 1.00.54, 52 Martin Roberts 1.02.24; 53 Stuart Wolstenholme 1.02.35; 54 Dave Collins 1.02.39; 57 Andy Forbes 1.03.13; 66 Chris Dewhirst 1.04.47; 70 Melanie Blackhurst 1.05.33; 75 Paul Brannigan 1.07.26; 85 Derek Donohoe 1.09.26; 102 Richard Blakeley 1.14.36; 106 Michelle Fuller 1.15.15; 106 Catherine Elvin 1.18.19; 117 John Lee 1.19.15.